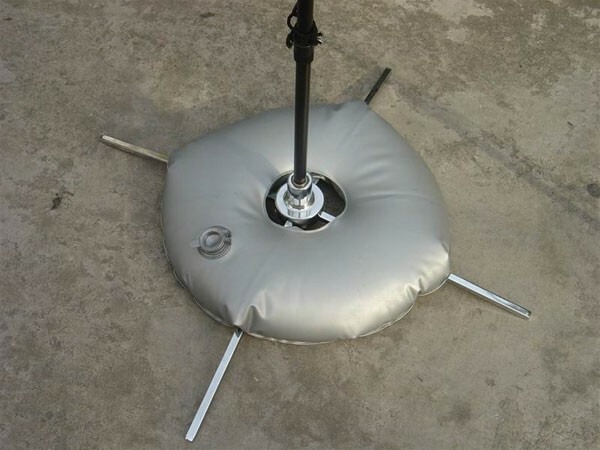 This donut shaped vinyl bag can be filled with water to add weight the X base of feather and teardrop banner stands to increase their stability on hard surfaces. This donut shaped vinyl bag can be filled with water and placed on the X base for feather and teardrop banner stands to provide extra stability. The Water Bag holds about 3 gallons of water and adds approximately 24 lbs of weight to the X base. The Water Bag is approximately 22" in diameter with a 4.25" hold in the middle. When filled with water, it is about 4" tall.